​No winter wardrobe would be complete without a classic cabled hat. Like a smart, dependable friend, it’s always there for you, making you look good. Ross is a deceptively simple hat to knit—lots of texture, but just one style of cable—so it’s a great project for both new and seasoned cable knitters alike. 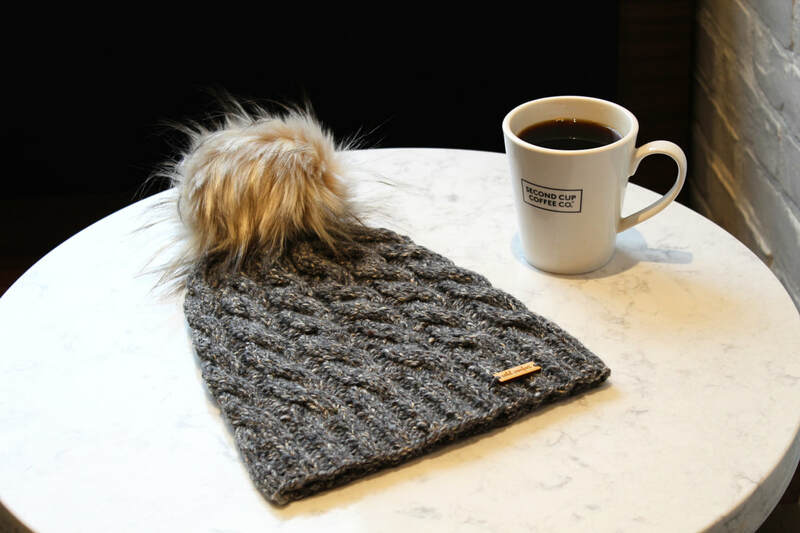 Knit the toque version for anyone on your list—it’s a perennial favourite. Or knit the slouchy version (with or without pom pom) for the hipster on your list that likes a cool city vibe. Toque: 9.25” (24 cm) length x 9” (23 cm) width / 18” (46 cm) circumference [un-stretched, after blocking]. Slouchy: 10.5” (27 cm) length x 9” (23 cm) width / 18” (46 cm) circumference [un-stretched, after blocking]. Both to fit 22-23” (56-58 cm) head circumference; average adult. ​The Fibre Co. Arranmore (80% Merino Wool, 10% Cashmere, 10% Silk; 175 yards [160 meters] / 100 grams): 1 skein in “River Esque" (toque version in main image) or “Glenveagh Castle” (slouchy version in main image). Sample toque version used ~ 145 yards / 135 meters / 85 grams. Sample slouchy version used ~ 170 yards / 155 meters / 90 grams. One 16” (40 cm) circular needle size US 7 (4.5 mm). One 16” (40 cm) circular needle size US 9 (5.5 mm). One set of four double-pointed needles size US 9 (5.5 mm). ​22 stitches & 25 rounds = 4” (10 cm) in Cable Pattern using US 9 (5.5 mm) needles; un-stretched, after blocking.